Networking tools for Windows are typically command-line programs or desktop applications. Under Windows 10, there’s a third format: apps that you download from the online Microsoft Store. Here we’re highlighting 10 networking tools that are available in the Microsoft Store and can be pinned as tile icons on the Windows 10 Start menu for convenient access. They’re all useful, and they’re all free. All My LAN lists your network's IP address, its profile name, and its maximum upload and download speeds. The amount of data that has been sent and received over the network is depicted in two line charts. By moving a slider, you can adjust the charts to represent the amount of data that was transmitted throughout the current day or up to the last 30 days. The charts can be combined to view as one chart. This app can also scan for any multicast DNS services or UPnP devices that are connected to your network. Clicking the name of a found device or service pulls up information about it, such as its IP address, manufacturer, and product name and model. This app can audit a Windows 10 desktop or laptop and report all the mobile data or Wi-Fi networks it’s been connected to. When you run Data Usage for the first time, it may take a while – anywhere from several seconds to a minute or so – as it scours your computer for its record of network connections. Data Usage presents the amount of data that the computer has consumed on networks as line and pie charts. The line chart tallies the total amount of data for each network your computer connected to over the current month. (This can be changed to show the previous month, the last 7 days or a range between two days you select.) The pie chart breaks down by percentage how much data was used on each network over the selected range of dates. Reports can be exported as CSV files, which break down the amount of data that was used by day. Data Usage is free but comes with banner ads. The pro version ($1.49) removes them. This app is comprised of tools that scan information about nearby network signals, including Wi-Fi ones, but its purpose has an emphasis on Bluetooth. When its Bluetooth Watcher tool is activated, Network Inspector continuously updates a list of Bluetooth devices that are within range. The app has a search box you can use to find a Bluetooth device that’s transmitting by entering its device ID into it. 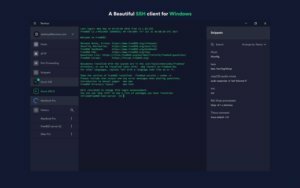 Another tool, an HTTP inspector, scans for and lists any HTTP servers on the local subnet of the network on which your Windows 10 computer runs. You can view the pages that are found, and other information about them, such as their headers. The developer has made the Network Inspector source available, which can be examined within the app itself. Network Inspector is free but comes with banner ads. To remove them, you’ll have to pay $20. But the price includes full access to the app’s source code for you to use and modify. Network Port Scanner is a standard port scanner for checking your network for any ports that are open and revealing the IP addresses they are open to. You can enter a range of IPs and ports for this app to scan, as well as setting a timeout in milliseconds. Termius is a full SSH client that lets you connect multiple times to a host, or multitask by connecting to several hosts at once and switching among them. It supports port-forwarding. You can organize your servers under group categories, and pair credentials and servers for quicker access. You can customize the UI of your sessions by choosing from several color themes and resizable fonts. These can be applied to the aforementioned groups of servers that you set up. This app lets you send UDP messages (datagrams, for example) to another client and to listen for UDP packets to test the responsiveness of this protocol on your network. UDP Sender/Receiver features three modes of use: Sender Only lets you enter remote IP and remote port numbers for a host, and a datagram, and the app then sends the datagram to the other client. In Receiver Only mode, the app listens for UDP packets from the local port. Sender/Receiver combines these two functions: sending your datagram and listening for a response. This is a suite of commonly used network and internet utilities. vxUtil includes DNS audit, DNS lookup, finger, port scanner, subnet calculator and WHOIS lookup. It also has tools to get the HTML from a URL, grab quotations from a quote server, remotely turn on a computer via Wake-on-LAN that’s asleep or turned off, and view the clock on a time server. vxUtil port scanner from Cambridge Computer Corp.
There’s nothing flashy here. These are the same kind of simple but essential network tools you find as desktop applications or terminal programs. vxUtil just brings several of them together under a single Windows app. So you can pin this app as a tile on the Start menu to have these tools conveniently available from it. This app lets you create shortcuts to wake a computer or other device on your LAN. In Wake on LAN, you create a configuration for the device (entering its name, MAC address and, if it’s on a WAN, host and port information). These configurations can be pinned to the Start menu, so you can wake a device by clicking/tapping its tile. This app is similar to All My LAN, but simpler and with an additional live tile function. 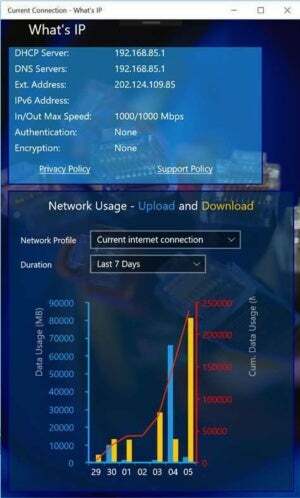 What’s IP displays specs about the network that your computer is on, alongside a bar and line chart that represents the amount of data that your computer has used on it. You see all of this on one page of this app, without needing to click to elsewhere. Presets let you view this information ranging from the last 24 hours to the last 28 days. General details about the network your computer is on is also shown on the live tile of What’s IP. This can be convenient to see at-a-glance without needing to launch the app. The pro version (for $3) lets you see more details about Wi-Fi networks and network profiles, and includes DNS lookup, ping and TCP port scan tools. There are lots of Windows apps that can audit Wi-Fi signals, including ones that have been featured above. But if you want one that focuses only on Wi-Fi networks, and gives you graphics to illustrate their signal strength, this is a good choice for free. WiFi Analyzer shows you the signal strength of Wi-Fi networks around you in real-time; you can toggle this graphic between a line or parabolic chart. You can also switch this chart to show different bands (i.e. 2.4 GHz and 5 GHz). Another page shows in a bar chart the signal strengths and technical details of all nearby Wi-Fi signals. If you upgrade to the pro version ($2 for a 12-month subscription), a few more features are added to this tool. These include a sensor that beeps to indicate Wi-Fi signal strength, and information can be shown on the WiFi Analyzer live tile about the Wi-Fi network your computer is connected to.